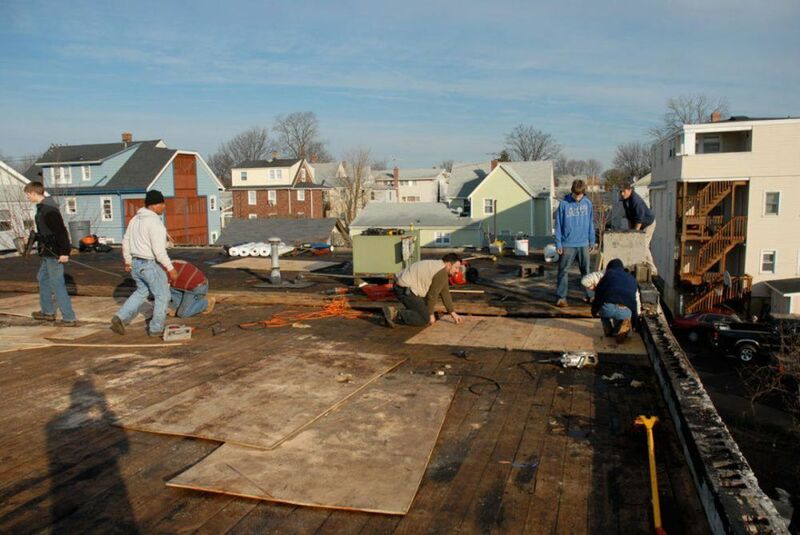 Commercial Roofs have the advantages of putting more crews to do the work. Roof Size – limited space causes movement restrictions of people and materials. The video below shows how an existing roof is stripped, cleaned, and prepared for the placement of a new membrane. Usually, the most labor-intensive work is cleaning and repairing the flashing. The video below shows where we have already replaced plywood and made the necessary preparation to install a new rubber membrane. The chances for a small residential roof to have leaks are good because there are many more objects that could be causing it. For instance, the post and railings. Every post needs to be properly flashed. The door that leads out to the flat roof has a sill, and the transition between the copper pan under the sill and the roof can be difficult to do. Siding and flashing. The type of siding and how it is installed can let water behind the flashing. The transition from a shingle roof to a flat roof has it’sd own issues. Fieldstone chimneys are the worst. Whenever there is a chimney that is built out of stone, it is almost guaranteed to cause a leak on the flat roof. With the small size of the roof and all the objects on it, takes longer to install and complete a roof than commercial roofs. Installing or repairing commercial roofs are always what we hope for. They are larger and have fewer objects in a confined area to deal with. Most of the time it is the Airconditioner units or drains that cause leaks. 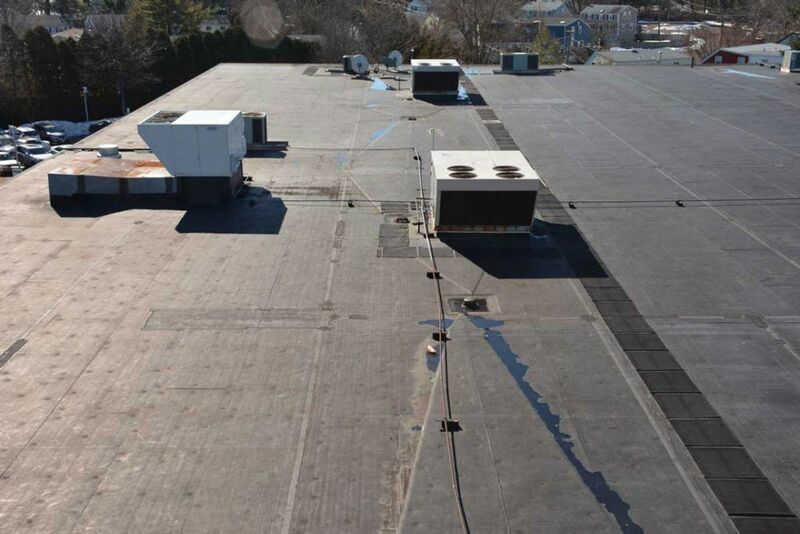 An EPDM rubber roof on a commercial building is the worst combination. 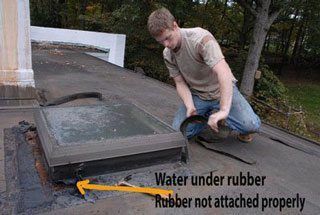 These roofing systems don’t last that long and when they start leaking, there’s almost no end in the repairs. The adhesives used to glue the seams together fails prematurely and causes leaks. Modified bitumen torch down roofing systems is the best. They can be repaired and its life can be extended indefinitely. 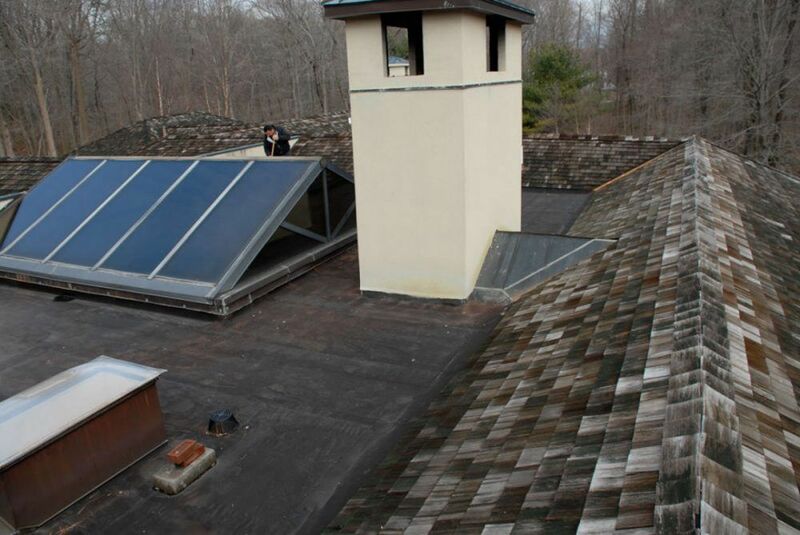 This image shows two skylights, chimney, vent pipe and roof shingles that make it harder and more time to consume to install a flat roof. Commercial roof more cost effective to install. More crews can move around on this roof. This means it gets done faster and more cost effective per square foot. Trying to find where the roof is leaking, is not easy on a commercial roof. This is a built-up roof and it has been repaired several times. To find leaks on a roof that big is not always easy. 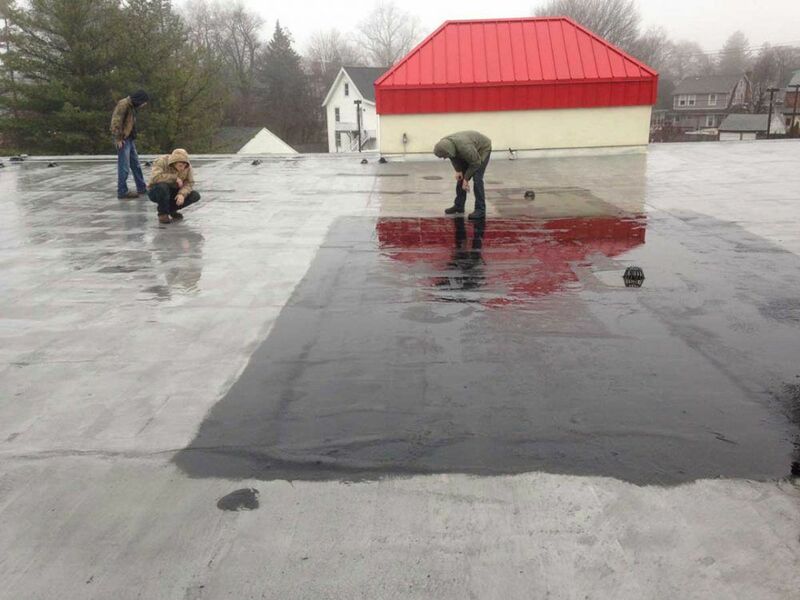 This EPDM rubber roof starts to leak due to the adhesive failures on the seams. Installing a roof like this cost less per square foot than that of a small residential flat roof. Ninety percent of the time, a leak can be traced to incorrectly installed flashing. 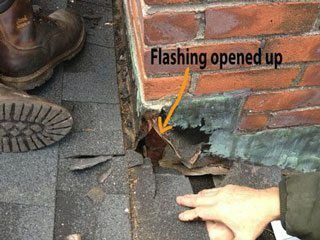 Installing flashing requires special techniques for different types of roofing systems. Regardless of what type of material is being installed on a commercial or residential roof, it is more important to choose the right flat roofing contractor.